Willy Hampton says the homeport for his new modified Rozinante yawl is Earth, but he sails out of Portsmouth, Rhode Island. 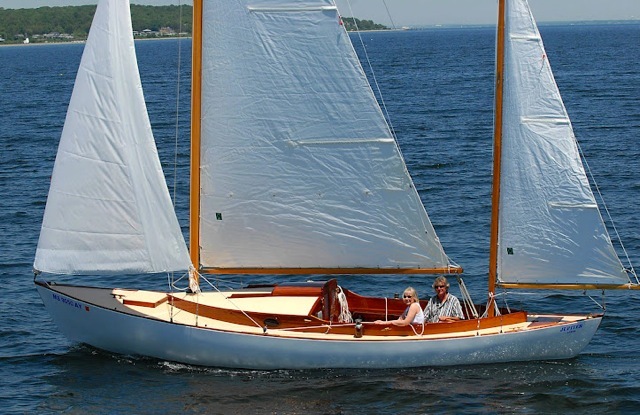 Doug Hylan (www.dhylanboats.com) reworked the L.F. Herreshoff design, widening the beam by a foot to 7′4″ for more stability and comfort. JUPITER is the second boat built with this modification, RED HEAD, covered in WB No. 123 was the first. JUPITER’s hull is strip-built of Spanish cedar on frames of laminated mahogany. The backbone is Douglas-fir. Willy encased the hull in epoxy and two layers of fiberglass. JUPITER has a cruising interior with a V-berth, twin settees, galley, and cedar bucket. Power is a Yanmar 1GM-10 diesel. Willy spent 4½ years on the project. He reports that the performance is better than anticipated as she runs up to 7.7 kts under jib and jigger so far. Everything is owner built except mast hardware, chocks, metal cleats, and ballast pour. The nonskid sand that he put on the deck is from the Sahara Desert.